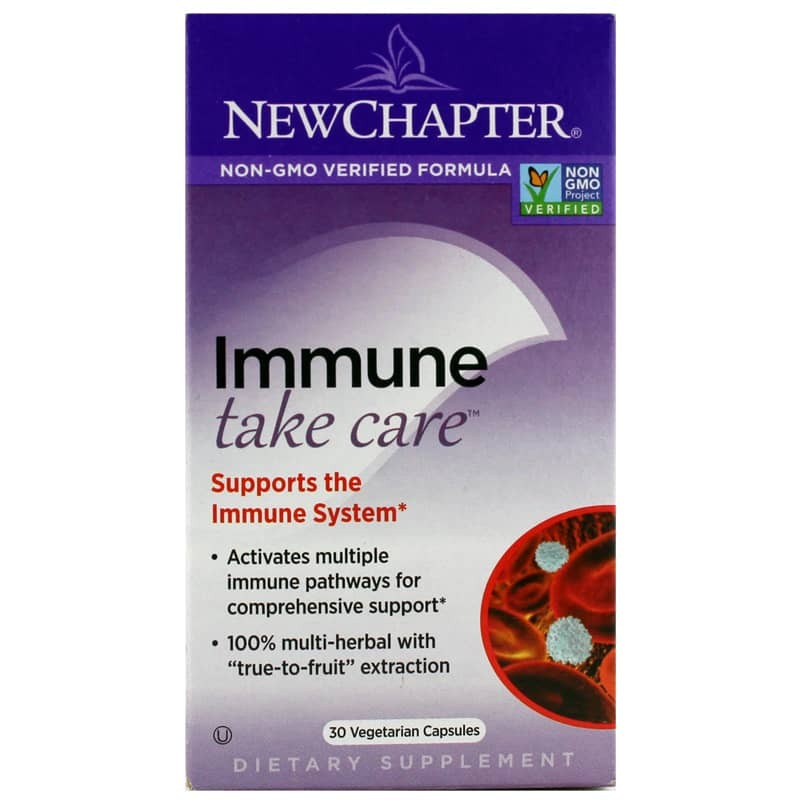 New Chapter's Immune Take Care is a dietary supplement intended to provide targeted care for your immune system health. The Take Care line targets specific areas of wellness and provides combinations of whole-food complexed vitamins, minerals, herbs and super foods to help promote optimal health. The antioxidative constituents in elderberry combine with those in black currant to deliver complementary immune-supportive benefits. The Austrian-sourced elderberry provides bioactive anthocyanins to support your body's natural immune defenses. Flavonoids that provide fruit with their color, anthocyanins are also powerful antioxidants. 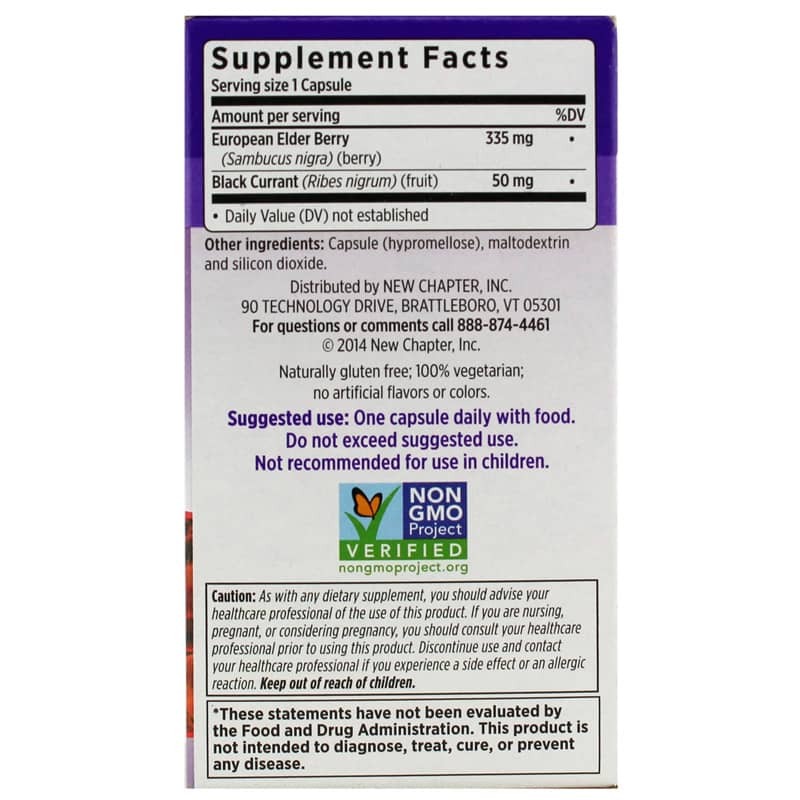 Black currant extract promotes healthy microbial levels, a healthy internal response, and healthy cell growth. New Chapter uses a special process to filter out sugar molecules from fruit while allowing natural proportions of beneficial phytonutrients to be delivered. Compared to whole elderberry and whole black currant, the extracts in this formula have the same profile of rich chemistries, but they are highly concentrated for your maximum benefit. To use as a dietary supplement, you can take one capsule daily. For enhanced defense, you may take one capsule twice daily. Other Ingredients: Capsule (polysaccharide [Aureobasidium pullulans], contains 2% or less of: carrageenan and guar gum) and maltodextrin. 100% vegetarian; no artificial flavors or colors. Naturally gluten free. Adults: To help maintain healthy immune system cells*, take one capsule daily. For enhanced defense, take one capsule twice daily. Caution: As with any dietary or herbal supplement, you should advise your healthcare practitioner of the use of this product. If you are nursing, pregnant, or considering pregnancy, you should consult your healthcare practitioner prior to using this product. Keep out of the reach of children.